Willow Tree collectible figurines make cherished gifts with their meaningful messages. The Promise of love statue portrays the love and closeness in a relationship, perfect as a housewarming gift for couples. 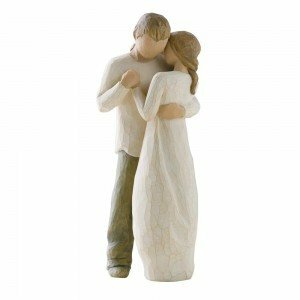 Standing 9″ tall with the couple in a tender loving embrace, this lovely figurine is packed in a gift box with an enclosure card. Made from poly resin, this loving couple figurine would certainly remind you of your love for each other. Sentimental with a happy feel, the Promise of love figurine looks beautiful displayed on the mantle. A gift that evokes strong feeling of love, this lovely Promise of love figurine housewarming gift for couples comes highly recommended.